Benco Dental announces iris brand 5% NaF Varnish White to Clear, an in-office topical fluoride treatment that goes on white and dries clear. Its rapid release treats hypersensitivity quickly as it makes contact with saliva to provide immediate and long-lasting relief. The treatment period is 4 to 6 hours; however it continues to release fluoride up to 24 to 48 hours after the application. 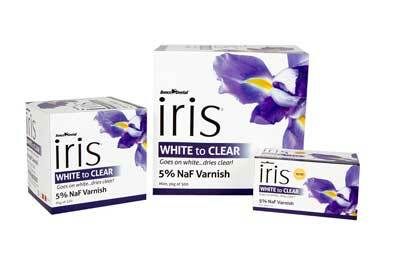 iris White to Clear varnish is packaged in an easy to use single-patient dose and is available in boxes of 30, 200, and 500. The gluten-free varnish is available in mint.